Bio: Carla Gomes is a professor of Computer Science at Cornell University and the director of the Cornell Institute for Computational Sustainability. She is the lead PI of an NSF Expeditions in Computing, establishing and nurturing the new field of Computational Sustainability. Gomes is a Fellow of AAAS and AAAI. Henry Kautz is the Robin & Tim Wentworth Director of the Goergen Institute for Data Science and Professor in the Department of Computer Science at the University of Rochester. He has served as department head at AT&T Bell Labs in Murray Hill, NJ, and as a full professor at the University of Washington, Seattle. He is a Fellow of the AAAS, ACM, and AAAI. Abstract of talk : Two real, immediate existential threats facing humanity are, first, the exhaustion of the earth’s physical and biological resources, and second, global contagion. AI will play a major role fighting both threats. In the first part of the talk, we will provide an overview of work in computational sustainability, an interdisciplinary research field with the overarching goal of developing computational models, methods, and tools for sustainable development. We will highlight crosscutting computational themes and research questions that have led to new CS/AI techniques. In the second part, we will describe how the billions of users of social media users unconsciously form a living sensor network, whose information can be datamined in order to track, predict, and prevent disease at a global scale. Bio: Eric Rice is an associate professor at the University of Southern California in the Suzanne Dworak-Peck School of Social Work. He is the founding co-director of the USC Center for Artificial Intelligence in Society, a center which is a joint venture with the Viterbi School of Engineering. Dr. Rice received his PhD in 2002 from Stanford University. He is an expert in social network and community-based research. His primary focus is on youth experiencing homelessness. Since 2002, Dr. Rice has worked closely with homeless youth providers in Los Angeles and in many other communities across the country to develop novel solutions to end youth homelessness and support young people across the nation who experience homelessness. Sharad Goel is an Assistant Professor at Stanford in the Department of Management Science & Engineering (in the School of Engineering) with courtesy appointments in Sociology and Computer Science. His primary area of research is computational social science, an emerging discipline at the intersection of computer science, statistics, and the social sciences. He is also particularly interested in applying modern computational and statistical techniques to understand and improve public policy. Abstract of talk : This talk will focus on the potential for AI to bring about social good. While the public frets over a future threat of killer robots or the dream of a driverless car, computer scientists and social scientists can engage in novel solutions to vexing social problems today. There are a vast number of societal challenges that can be addressed using artificial intelligence. 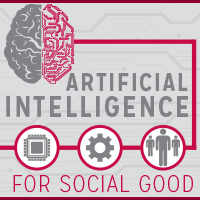 We will provide insights into how AI can inform social good and what problems and techniques can used, with a special emphasis on the promise of trans-disciplinary work.